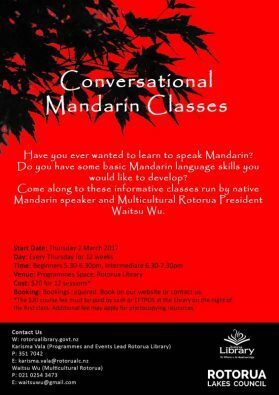 There are now two Mandarin Language classes available in Rotorua. One is being held at the Mokoia Community Centre on the 3rd Wednesday of the month. Contact the Community Centre for further information and to book a place. There is a $ 20. fee for the workbook. The other is being held at the Rotorua Library on every Thursday evenings for a 12 week period. Booking is required. The cost is $ 20 either by cash or EFTPOS at the library. Beginners 5:30 – 6:30 followed by intermediate class 6:30 – 7:30 Contact Karisma Vala at the library for further information. Next articleSIX MONTHS IN SHANDAN! I made it!